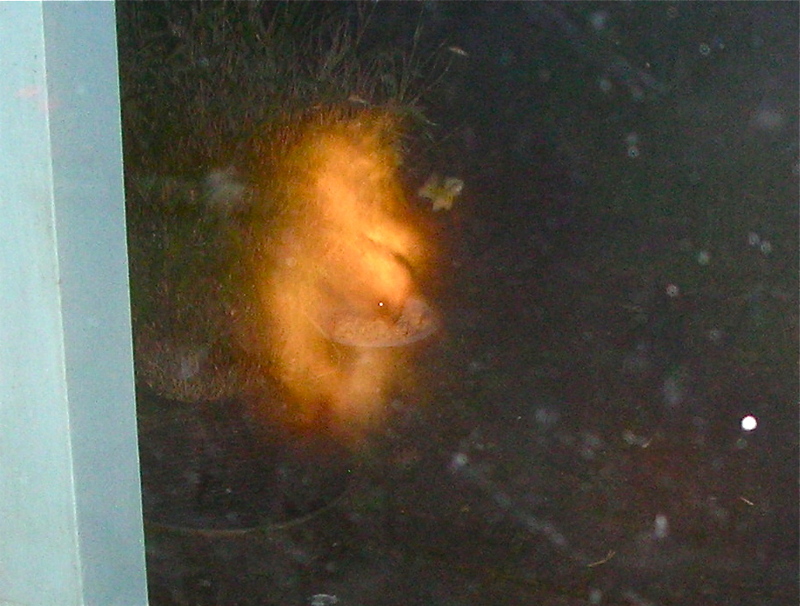 A few days ago, something outside the window started bouncing and caught my eye. Two tiny birds were spirally jerkily. I think they were fighting since, after about ten minutes of playing hide and seek, the winner seemed to be in sole possession of the field. This fellow haunted the bushes and windows, peering in at me and darting off, he resembled nothing so much as a yo-yo, and he NEVER stayed still for a second. I am a point and shoot photographer with a simple camera. I tried, I really tried. 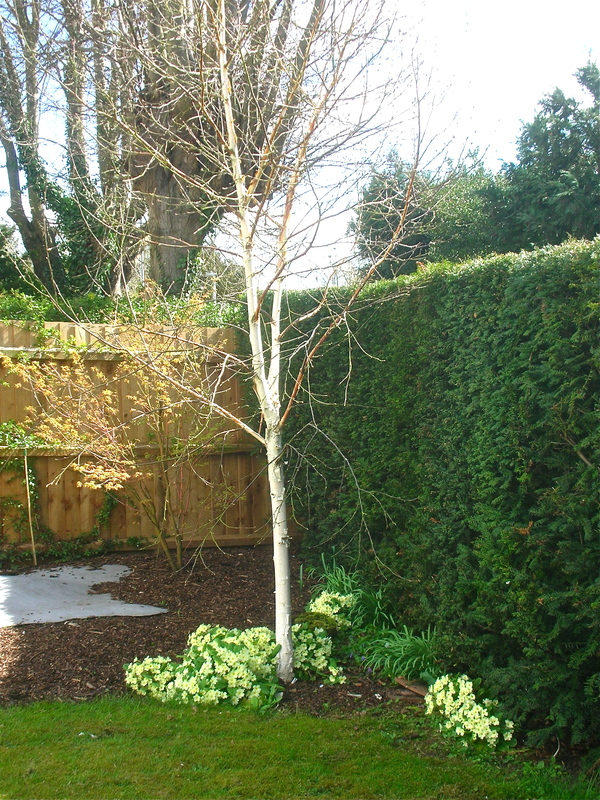 Look carefully and you may spot one camera-testing Goldcrest. A week ago we began to put out some hedgehog food, though there had as yet been no signs of them. The plate was emptied on the second night and it looked like the kind of slightly muddy clearance that the hedgehog makes. 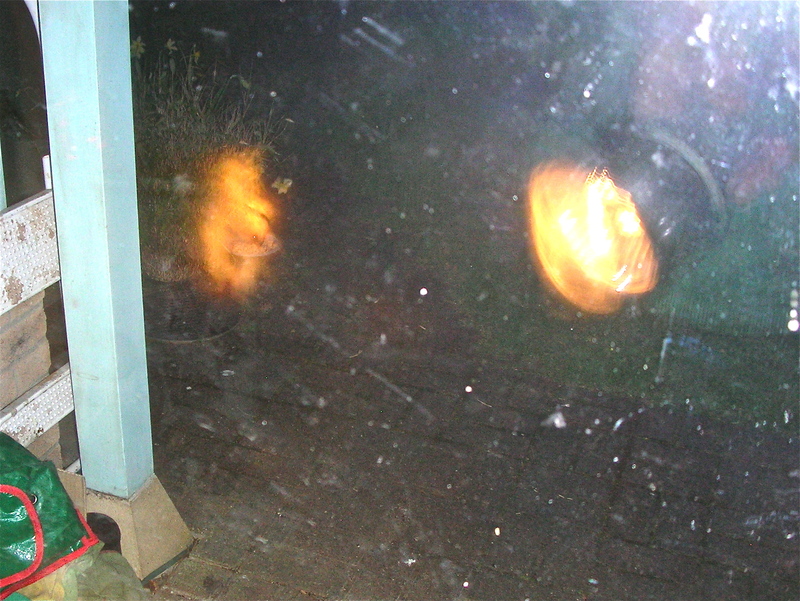 On the second night there was a clearence around 10 pm, so on the third night I sat and watched from inside the house shining a torch at intervals through the glass back door. He came; I saw him/her. Night-time photography by the aid of torchlight through a glass door is not my forte either. Here is a picture of a very dirty back door with a reflected torch. If you look with the eye of faith you will see, in the middle of the patch of light on the left, the gleam of a hedgehog eye. In the enlargement below you can at least make out the plate of food. Believe me there is also a hedgehog eating it. Spring is here. These primroses started flowering in November, this is surely their peak now. Clematis macropetala a never-failing spring joy. 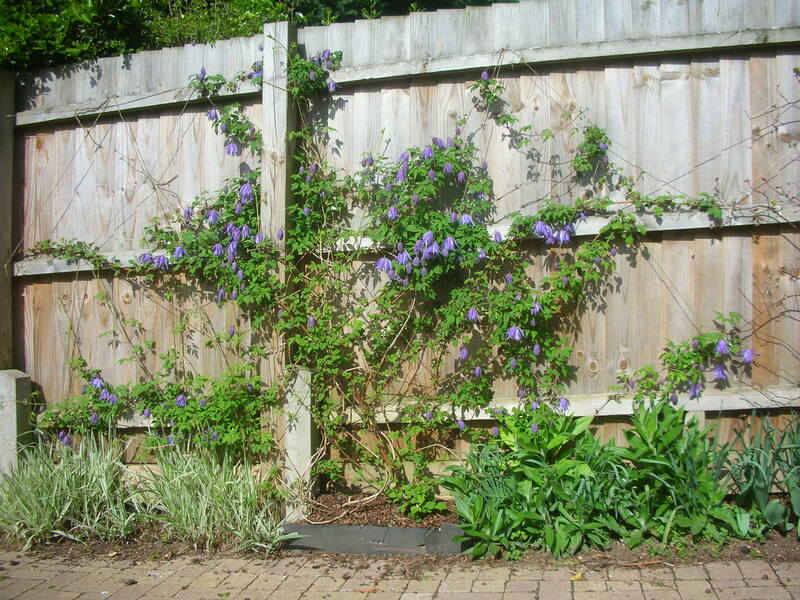 This entry was posted in Gardens and tagged clematis macropetala, Goldcrests, hedgehog, primroses by hilarycustancegreen. Bookmark the permalink. Lovely that you are able to feed hedgehogs! I’m really impressed with your primroses, they are so prolific. Exciting to see your garden come to life. The little bird looks like what we call a white eye. Not sure of it’s real name. What is your creeper on the fence called Hilary? Is it a clematis? Yes, we’re lucky. Don’t know what’s got into the primroses this year, they seed wildly all over the garden, but I’ve never know them to bloom so prolifically. The White Eye seems to be Southern Hemisphere only. This is what a Goldcrest should look like. Yes, it’s a clematis macropetala. You are putting your camera to the test here and how! And is that the scenario of your latest book peeking out of the green folder? I think it is me, as much as the camera. Yes, that is a carbon of a page of the dossier my mother made to take to the war office to help the debriefing of rescued Far East POWs. Shows how easily I am distracted. We are butter spread too thin. Yes, I saw the hedgehog’s eye, quite a feat doing it with a torch and yes I do believe you. Here the Manchurian pear is starting to change colour and the mornings are around 8c or so. Glad you could make out the eye! We are slowly heading the other way, nights are down around 2c to 6c, but days are warming up we are promised as much as 20c tomorrow! However, this is the UK, we could have a -5c frost next week and my veg will bite the dust. I can see the hedgehogs eyes. How wonderful to get native animals into your yard. Yes, we are very lucky indeed. 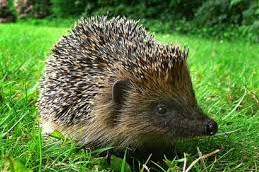 There have always been hedgehogs around here 9though you rarely see them), but we never fed them until last year, when reports of a drop of over 50% in the population alarmed us. 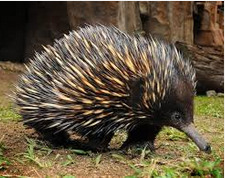 Your hedgehogs and our echidnas – couldn’t be much more different, eh ? Aah, thank you, I should have included a proper picture too. The Goldcrests are incredibly cheeky – but SO fast and bouncy. Yes, I could see the hedgehog’s eye in the enlargement which was a very striking photo. If you put any food out for them, try to put out a bowl of water if you can. They have an unfortunate habit of trying to drink from garden ponds, sometimes with terrible results if they cannot get out. You are really lucky to see Goldcrests so close up. They are so charismatic, tiny little birds. We try and keep an eye on this. We have a very dry garden, and no pond, but we have many water butts and there are various nooks round the butts which usually have water in them (and where slugs and therefore hedgehogs like to congregate). There are also two bird baths, regularly filled and splashed overboard. The Goldcrests only appeared about a year ago, but we’ve seen them several times since. Sadly, thrushes have vanished, I keep hoping they will reappear. Great photos. I love your clematis. Gorgeous! 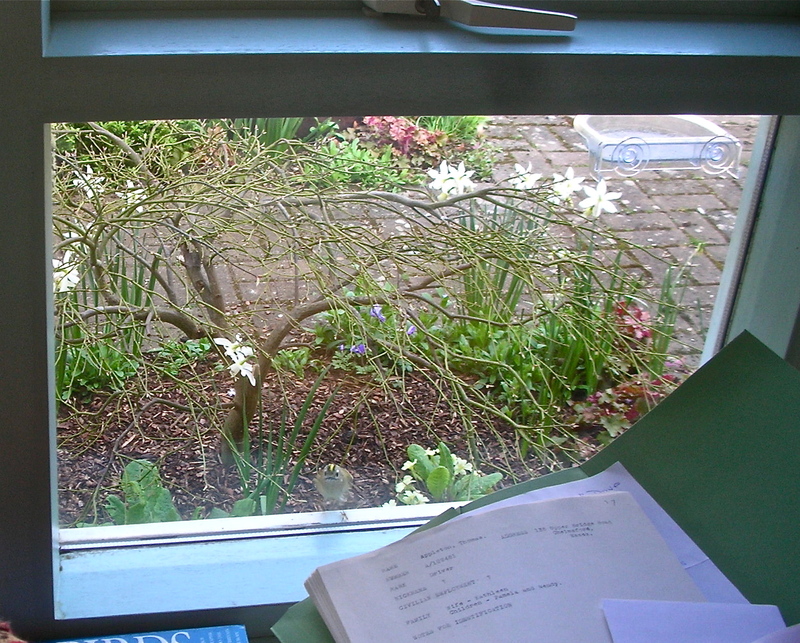 Thanks, I love that clematis too, it is an offshoot and has taken root in a tiny patch of earth. I performed an act of faith, and lo! I saw the eye of the hedgehog! Hooray! it is amazing what suggestion will do! I saw the hedgehog and the little goldcrest. Lovely garden visitors. Your primroses are magnificent and that clematis is splendid. Thanks, you have acute eyesight! I think weather conditions must be primrose heaven as they have gone bananas this year. Love your garden posts, Hilary. They take me away from my desk! And your garden visitors are quite charming, despite their manners. Thanks. All too often they take me away from my desk too. With an eye of faith (I love that term), I sort of see a hedgehog. Not really, but I trust you implicitly. I cannot for the life of me get a decent shot of any of the birds swarming about my feeders, so I completely understand your difficulties. The clematis is just lovely. 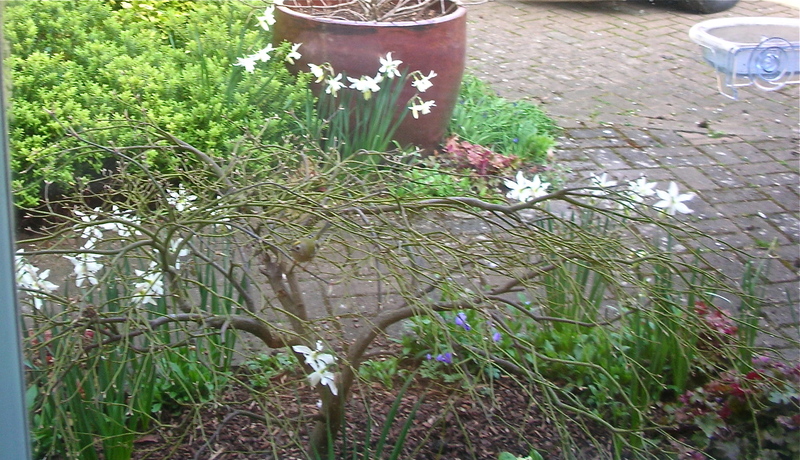 Mine is starting to bud and with the soft rain that is falling today, I may be lucky and have blooms soon. Yes, I have wasted a lot of camera time on the feeders, but they provide great pleasure. I am a persistent bud-watcher too. I love the anticipation of days, or even weeks with the tree peony, of watching them slowly grow and burst open. I’m doing exactly that right now, Hilary. Exactly that with several things in the garden. Isn’t it a wonderful activity and there’s something to watch almost all year round. My Grandad has foxes and hedgehogs, he can only see them because of some solar globe ornaments 😊. That’s a good idea, we had some solar lighting, but it sort of faded away. I will get some more. Well, I had a wee bit of difficulty spotting the bird but did make out the little spiny thing. ☺ While I’m not sure of which point and shoot you have, I have a couple of thoughts. (1) some digital cameras now can really bring out details in the shadows without flash but you will capture unwanted movement, (2) if you can press the head of your “torch” flat against the glass, you should get less glare, and (3) if your lens does not change in length while focusing (not zooming), you can also press your lens flat against the surface of the window to also reduce glare. Lovely garden and the hedgies are adorable!